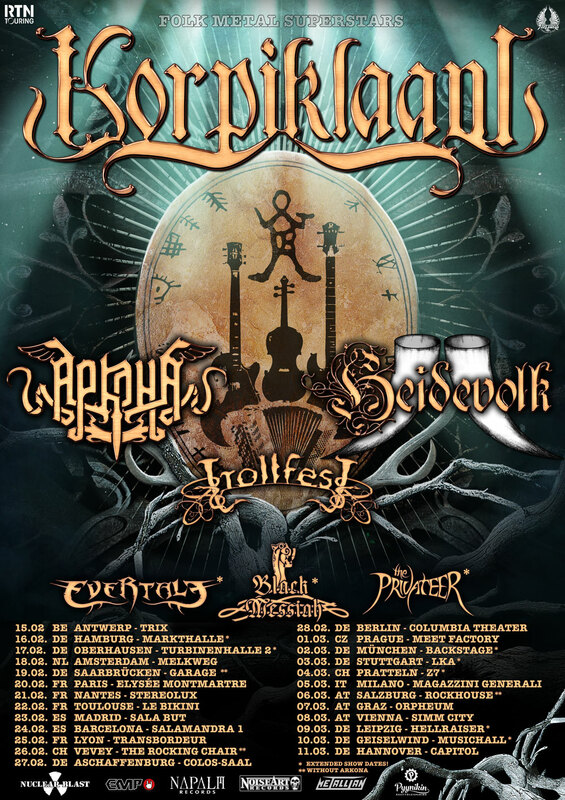 KORPIKLAANI ANNOUNCE EXTENSIVE EUROPEAN TOUR with ARKONA, HEIDEVOLK, TROLLFEST & many more! KORPIKLAANI ANNOUNCE EXTENSIVE EUROPEAN TOUR!With Very Special Guests ARKONA, HEIDEVOLK, TROLLFEST & More! Folk Metal Superstars KORPIKLAANI featuring very special guests ARKONA, HEIDEVOLK and TROLLFEST present a tour that will make every pagan and folk metal heart beat faster! This is one of the biggest packages this genre will have to offer in recent times. On selected weekends, they will be joined by BLACK MESSIAH, EVERTALE and THE PRIVATEER for extended shows to match any Paganfest or Heidenfest. Formed in 2003 in Lahti, Finland, KORPIKLAANI brought the traditional folk music back to life. While other folk metal bands began with metal before adding any folk sounds, KORPIKLAANI - originally reincarnated from their previous band Shaman formed in 1996 - started with folk music before turning into metal. To that date, no one could have foreseen that such a large, worldwide audience would celebrate the mythology and musical spirit this band uniquely delivers. Nine successful and critically acclaimed studio records as well as their recent first DVD- release filmed at the legendary Masters of Rock, showcases their global status as the pioneers of folk metal! Finally, KORPIKLAANI will return live on stage in early 2018 for an extensive European tour! KORPIKLAANI have now left a message to all their fans out there and welcome you at their upcoming shows, check it out right HERE!